A unique multi university research initiative funded by the U.S. Navy has resulted in a new generation of robotic-like jellyfish. The movement of the robot though water which has been show on video is extremely similar to its biological sibling and the Navy is hoping that groups of these robots can survey the oceans and look for enemy ships and subs. Engineers at the University of Texas, the Virginia Polytechnic Institute and State University with colleagues from several other institutes in the U.S. have developed a robot that mimics the motions of jellyfish. The underwater robot was originally developed for the U.S. Office of Naval Research back in 2009 but recent developments improved the performance of the jellyfish, allowing it to overcome some of the limitations of its previous generation. 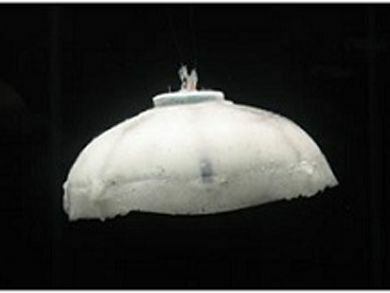 Biological jellyfish uses the bell section of its body, which changes shapes and contracts to provide thrust as it glides through the water. The lower section of the bell is known as the flexible margin, and it changes shape slightly later during swimming than the rest of the bell. The original, Robojelly lacked this vital piece of anatomy in its design which was added by Prof. Yonas Tadesse and his team from the University of Texas. Prof. Tadesse and his colleagues looked at several different designs for the Robojelly, some with an artificial component similar to the flexible margin. The problem was that artificial materials tend to fold as they change shape, affecting the Robojelly’s performance. After many tests the team discovered that creating slots into the bell reduced this folding effect resulting in a smother swimming motion and improved speed for the Robojelly. As a long term goal of the project the Navy is looking to create groups of robotic jellyfish working together and communicating with each other as part of an underwater network that can perform all sorts of missions ranging from purely military ones such as detect the presence of ships and submarines and report back or more civilian oriented ones such as look for chemical spills and observe the migration of different kinds of underwater creatures. You can find a video demonstration of the Robojelly in the following link. More information on the Robojelly can be found on the Virginia Polytechnic Institute and State University site. TFOT has previously reported on a variety of other robotic creatures, including the GhostSwimmer spy vehicle developed for the United States Navy based on the Bluefin tuna, the Airacuda pneumatic robot based on the barracuda, the AirJelly robot designed to fly through the air using the same mechanisms jellyfish use to move through the water and the Robofish developed by researchers at the University of Leeds in the U.K.
Concorde’s Successor will have a Double Wing?